As the nation counts down to the next general election starting with the presidential election which is next Saturday, there are foreboding signs that the elections will be one between the Independent National Electoral Commission (INEC) and the Nigerian people. This contention is backed by glaring signs that the leadership of the commission is not demonstrating convincing commitment to building off on the successes of the 2015 elections, which in itself will be a monumental disservice to the country and the international community. There are a handful of such signs. From all indications, many registered voters could have been disenfranchised on account of their inability to collect their Permanent Voters Card (PVC) had INEC not extended the dates for collection. By INECâ€™s Election Guidelines and Regulations, the collection of PVC was meant to have closed last Friday, a time thousands of Nigerians scattered across all of the nationâ€™s six geopolitical zones had yet to access their PVC and in many cases due to no fault of theirs. Hundreds of thousands of Nigerians were deliberately frustrated by INEC staff from collecting their PVCs even after several visits to the collection points. Many of them had to make excuses a couple of times from their employers to either be absent from work or resume work late just so they could collect their PVC in order that they could perform their civic duty of voting their choice candidates in the forthcoming elections. But their efforts were allegedly frustrated by the commissionâ€™s staff. Several complaints about this in the print and electronic media appeared not to have initially stoked the commissionâ€™s leadership into action to device a seamless process of PVC collection. Certainly, it would have been an indictment on the commission if a significant number of eligible voters had been shut out of the voting process eventually. A possible remedy was eventually devised and that was by extending the collection time beyond last Friday, which automatically opened a window to the effect till tomorrow, Monday, February 11. But much may not be achieved yet if the process of collection and the behaviours of INEC staff in charge of releasing the PVCs remain the same. The extension itself is yet another failing, given that the commission had all of four years to prepare for the once-in-four-years ritual. So, why the last minute rush? But while the extension is commendable, INEC can still push till mid-week if indeed it intends to show genuine commitment to delivering effectively with this election. Certainly, there are existential concerns with INECâ€™s preparation for the forthcoming election. And this stems from one or two unpopular provisions contained in its 2019 Election Guidelines and Regulations. Thus, by the commissionâ€™s published guidelines, certain provisions do not favour free, fair and credible elections, one of which is the adoption of continuous accreditation and voting. The insistence of INEC to adopt the continuous votersâ€™ accreditation and voting, against popular opinion exposed the commission to fiery criticisms from various quarters just as the condemnation of it has been loud among critical stakeholders in the electoral process. In the 2015 elections, what obtained was that different belts were allotted for accreditation of voters and voting proper. This helped to ascertain the number of accredited voters before voting commenced such that it checked the chances of votes cast outnumbering that of accredited votersâ€™ right before hand. And where such was perpetrated it made it easy to detect when matters get to electoral litigation stage. One of the strengths of this process is that it easily comes handy when resolving cases of electoral dispute that bordered on over-voting, ballot-stuffing and any other electoral frauds. Some have argued that the process is time-consuming. Those who hold this view argued that having to register, go back home and then return to vote is also cumbersome. It may be, but it is definitely nothing too much to sacrifice for the benefit of a rancour-free election, after all, it is just for that day. Besides, certain peculiarity of the Nigerian environment, democracy and electoral process, which is still in its learning stages, knocks off the argument about time factor. This is even more so considering the penchant among Nigerian politicians and political parties to dispute every election results that does not favour them. What more, the fact that the continuous accreditation and voting model is a rather unwieldy process â€“ where the processes of accreditation and voting runs into each other, is even a compelling reason to jettison the model. Added to this is the reasoning that it takes transparency away from the process as it makes it difficult to juxtapose number of accredited voters against actual votes cast in case there is electoral dispute. Clearly, INEC got it wrong going for the continuous accreditation and voting model even against public disquiet about it. As the saying goes, why fix it when itâ€™s not broken. It is noteworthy that former INEC Chair, Prof. Attahiru Jega achieved so much with the 2015 general election, because he carried all stakeholders, including political parties along. Carrying them along afforded him the smart choice of sometimes using them as sounding board, and some of their valid observations and suggestions were incorporated into the elections guidelines and regulations during his time. Eventually, he was widely commended not only for sticking to the agreed rules of engagements; he was also hailed on account of transparency. Unfortunately, with the way INEC under Prof. Yakubu is going, it is left to be seen if history would be that kind to him post-2019 general election. There are credible concerns that even with the introduction of electronic transmission of results right from polling units onward, it might still be a case of one bad apple soiling the whole lot. Interestingly, the international community has indicated interest in the electoral process, warning all players in the process of the consequences of truncating the process or abusing it. Interestingly, the international community has indicated its deep interest in the forthcoming elections. Weeks back, the European Union inaugurated its Elections Observer Mission in the country with a charge on all stakeholders to ensure the success of the process even adding that the election presented the country with the opportunity to consolidate on the gains of the 2015 elections. On its part, the United States government had also warned that it was placing certain players in the process under watch even as it disclosed that sanctions will be meted out to anybody that attempted to frustrate or truncate the process. It is gratifying that the international community, particularly the EU, The Commonwealth and the United States are keen on a successful election and not just content with simply affording the country and its many institutions bilateral assistance as it is important that such assistance is justified with certain standards including the nationâ€™s electoral process. 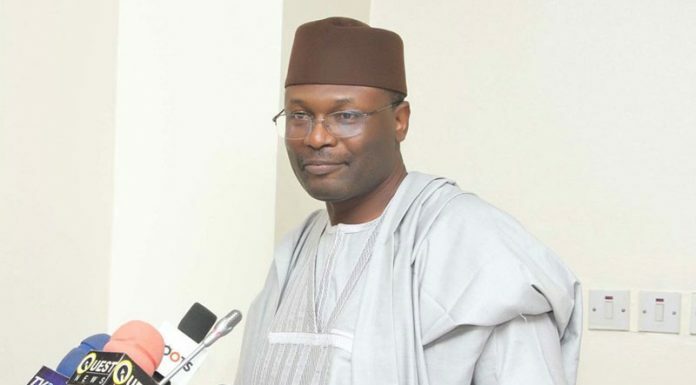 In the final analysis, it is important that the current INEC Chairman realises that the way things have panned out at the commission under his watch suggests that the election is between INEC and Nigerian electorate and definitely not one between the two leading political parties. This is so because the parties have done their bits campaigning for votes and so far played by the rules it came up with, while Nigerians on their part have shown commendable readiness to exercise their rights to vote for their preferred candidates and parties during the elections. The onus therefore falls on the commission to ensure that everything goes well and the election is free, fair and credible. No excuses will be tenable. It is also noteworthy to remind Prof. Yakubu that being the one on whose table the buck stops, it is his name, career and reputation that are at stake, thus, he must ensure that the election is successfully conducted. He has a choice to make: whether to go the way of the heroes like the likes of Humphrey Nwosu and Jega or to go the way of Maurice Iwu and Ovie-Whiskey. The choice is really hisâ€™ and the world is waiting to see which one he eventually makes.